Taking myriad forms, the best Acer laptop for gaming is but a click and a screech away. The best Acer laptop for gaming truly stands out in a world overrun by three-headed snakes and exasperated dragons. Sure, every time I power on one of its Predator-branded systems, I bellow in terror and frustration at the comical absurdity of its vehement start-up squall. Yet I admire the company's long-standing affinity for cooking up elegant gaming notebooks, modern in appearance, that don't require a small loan to afford. More often than not, Acer strikes an unparalleled balance between value, performance and design. But it also has a huge catalog of laptops to choose from. Therefore, pinpointing exactly which of its products constitutes the best Acer laptop for gaming 2019 has to offer is a daunting task. Because of the sheer breadth of specs, styles and price points in its portfolio, finding the best gaming laptop to suit your needs isn't as obvious as it sounds. In an effort to identify the best Acer laptop for gaming—Helios, Triton or otherwise—I've benchmarked every model and submodel configuration I could get my hands on. That said, by no means was there an irrefutable winner amid my assessment of the best Acer laptop for gaming, which is why I've included a pair of honorable mentions as well, in case my top pick, for whatever reason, just doesn't do it for you. Once you get past the initial dread of its god-awful startup sound, the Acer Predator Triton 500 is hands down one of the best gaming laptops I've ever used. Small enough to fit in a backpack and light enough not to weigh you down, it stuffs a 15-inch screen into a 14-inch frame for an RTX gaming experience that is, against all odds, both portable and potent. It doesn't have the strongest battery life, having conked out at less than three hours in our in-house battery test, however its power brick is somewhat compact, perhaps negating the need for a battery altogether. You can't expect to play graphics intensive triple-A games off the charger anyway. What you can expect from the Acer Predator Triton 500 is a blissful, quieted high-performance gaming laptop capable of outpacing the latest consoles exponentially. You can get it in RTX 2060 and 2080 flavors, and while the latter can be configured with up to 32GB of RAM and 1TB of storage, I recommend the middle of the road option for the best value: Intel Core i7 processor, RTX 2080 graphics, 16GB of RAM and 512GB of NVMe PCIe SSD storage. If it weren't for a handful of glaring design oversights, and a notable lack of screen resolution choices above 1080p, the Triton 500 would be a perfect machine. Still, it's a relatively inexpensive gateway to ray traced graphics rendered in real-time, deserving of its place on the best Acer laptop for gaming throne. Though it's comes in 15.6-inch and 17.3-inch flavors, I prefer the 15-inch Acer Predator Helios 300, a budget-minded clamshell made for gaming in each of its many forms. Despite being available in ten different configurations, it is consistent in a couple of regards. For one, it leverages Intel's 8th-generation Core i7-8750H processor, a six-core chip clocked at 2.6GHz out of the box. Boot up one of your favorite CPU-heavy game, such as Far Cry 5 or GTA 5, and you'll see clock speeds of up to 4.1GHz. On the graphics end, the Helios 300 relies on Nvidia's GeForce GTX 1060 mobile chip across the board. Aesthetically, the Acer Predator Helios 300 is almost indistinguishable from its competitors. It is a black and red midrange gaming laptop festooned with angular embellishments that fail to distract from the threatening aura of its ominous Predator branding. Nevertheless, given its diverse assortment of prices, there's bound to be one or two that suit your financial needs. By skimping on inconsequential components (for gaming, at least), like storage and RAM, you can save yourself a hefty chunk of change. Especially if it's meant to complement your existing desktop rig, the Helios 300 is a solid, lower-cost alternative to the RTX-equipped Triton 500. 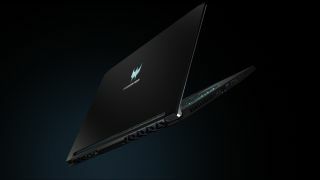 While it's sure to be ousted by the Decepticonian Acer Predator Helios 700 slated for July, the Acer Predator Helios 500 is a compelling 17-inch gaming laptop you can buy right now. Boasting up to an overclockable, desktop-class Intel Core i9 processor paired with a powerful, non-Max-Q Nvidia GeForce GTX 1070, the Helios 500 is as close as you'll come to its full-size PC tower equivalent. Alternatively, should you fancy red over green, it's one of the few gaming laptops on the market you can outfit with an AMD Ryzen CPU and Radeon RX Vega graphics. Of course, in doing so, you'd miss out on the opulent convenience of native G-Sync support. Much as I like the Acer Predator Helios 500, when I tested it out for myself almost a year ago, it lasted just under a mere three hours off the charger. And although you can find it at a steep discount nowadays, I still think it's priced a little high considering its shell is made entirely out of plastic. Otherwise, it's the best Acer laptop for gaming on a 17.3-inch display. Not the most powerful for the price, but not prohibitively expensive either, the Helios 500 is unique, insofar as it gives you the keys to overclock its CPU and GPU at the click of a button. Well, assuming you opt for the Intel Core i9-8950HK version. Some online stores give us a small cut if you buy something through one of our links. Read our affiliate policy for more info.